Used to pass fluids through the structure of a part, internal channels are a common feature found in parts from a variety of applications. Traditional manufacturing methods have limited the achievable geometry of these channels to mostly straight, cylindrical paths confined to a single plane. Anything more complex can be difficult or impossible to achieve, requiring complex and costly workarounds. Two common examples of parts requiring internal channels are tooling applications requiring cooling and heat exchangers. For tooling applications, internal cooling channels allow for higher performance including faster cutting rates, shorter cycle times, and longer tool life. In heat exchangers, internal channels allow for highly efficient designs with increased surface area, resulting in a dramatically faster heat transfer rate. 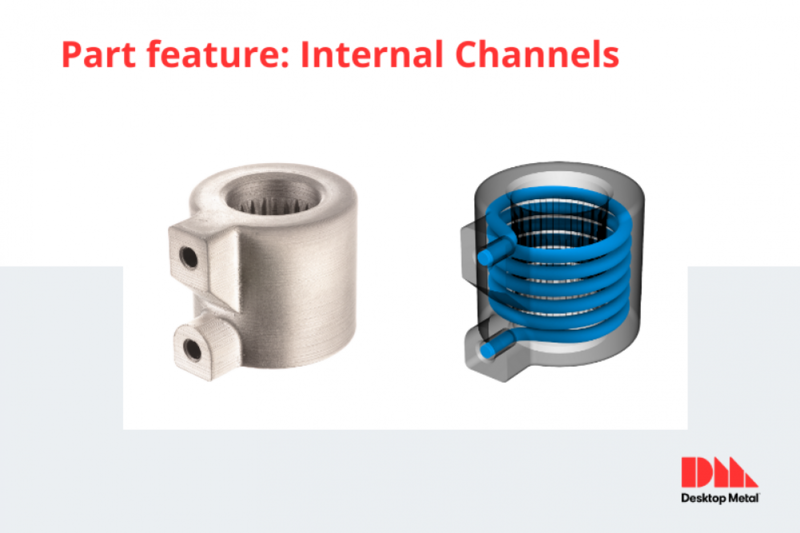 Currently, complex internal channels are often formed by casting or machining two halves of a part and joining them, often by welding, to create an enclosed internal channel. This produces planar channels at the seam of two halves. The part can be further segmented into sections to result in more seams and thus more opportunities for planar channels. 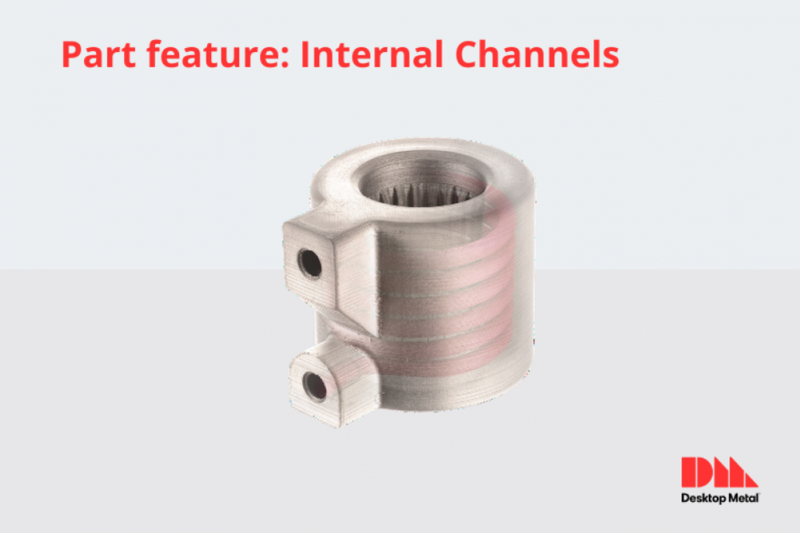 Additive manufacturing allows for non-planar internal channels to be built directly into the part, significantly reducing manufacturing complexity and introducing possibilities like complex conformal cooling channels and complex custom manifolds. The most common way to currently achieve this is through DMLS, though this dangerous, slow, and high-cost process makes this manufacturing method unrealistic for most applications. With Bound Metal Deposition (BMD), custom parts with complex internal channels can be made easily and affordably in a matter of days. Since BMD builds parts layer by layer, this opens up the ability to create cost-effective tooling components (such as dies, molds, and cutting tools) with conformal cooling channels, manifolds with entangled internal channels to consolidate size and improve performance, heat exchangers with greater heat transfer rates, and many other parts with complex internal channels.